For those of you who like the world of art, such as sculpture and painting or for those of you who are not connoisseurs of the art world, very worth for you to visit Nuart Sculpture Park. Why is that? Because besides you will see firsthand and get to know more about works of very high artistic value from a world Mestro from bali Nyoman Nuarta, also you can see the exhibition and discussion of all the art kerya here, because the museum Nuart Bandung is also a gathering place for the Artists, curators, art lovers and even desinerers with great works of art. The traveler's friend, peeling about Nuart Sculpture Park, is of course incomplete if we do not know and get to know the history of the founder or the owner of nuart gallery, Nyoman Nuarta. Born in Tabanan Bali, and now settled in Bandung, this world-class sculpture artist is a graduate of the Faculty of Fine Arts one of the leading universities in Indonesia in Bandung, ITB in 1979. Nyoman Nuarta has been known as an artist who has produced many works of art in the form of hundreds of sculptures with a very natural style. The maestro makes a lot of sculpture from brass base material to copper. So it is not wrong if the great works have spread and can be found in many cities of Indonesia and remarkably is some of his work has been made a collection of art goods both at home and abroad. Nyoman Nuarta's expertise as a master sculptor and sculptor has indeed been recognized internationally. 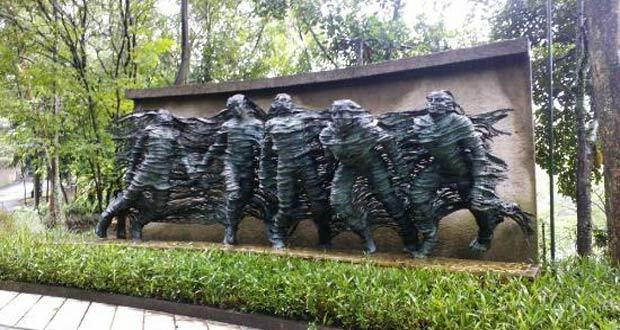 Known by many as a sculptor or potential and great sculptor since winning the Indonesian proclaimed sculpture contest in 1979, Nyoman Nuarta has also actively joined several sculpture organizations such as the Royal British Sculpture Society, the International Sculpture Center Washington and Steering Committed For Bali Recovery Program. Already many awards or appreciation of the work and copyright art sculpture that has high artistic value both from the government of the republic of Indonesia and from abroad to the private sector. Among his work he created to design various trophies for various sports tournaments, such as the first Indonesian professional football competition, the Dunhill League in 1994, where Persib was the owner, as well as the National Basketball League Trophy for the 2011 to 2012 season. 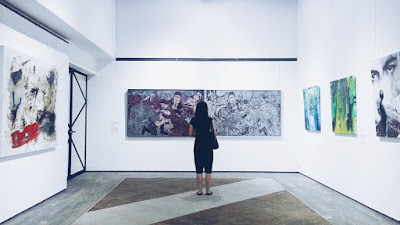 The first time you enter the tourist area of art museum gallery nyoman nuarta in this bandung, then you will immediately treated to a wide range of sculpture artwork that looks beautiful and very deep containing philosophy. By walking around the outdoor or outdoor courtyard of Nuart Biulding, you will see a number of artistic sculptural works such as sculptures with the name "Waiting", a horse statue with a female face on its back, a statue of "Man you cosmos", a statue of Nightmare , Fire Horse and Trap as well as others. Its location is in the gallery room Nuart. With an area of ​​nearly 1000 square meters, inside there are 2 floors. Floor 1 is used as an exhibition space or artwork from the owner of Nyoman Nuarta, while the second floor is used or rented to other artists for exhibition or exhibition Their artworks. N Cafe offers a variety of culinary like typical Balinese food such as balinese duck crispy or crispy duck and nasi campur.Lokasinya located in the center of sculpture park tourist area that will offer experience berkuliner ria. Here you can buy miniature works of nyoman nuarta sculpture, as well as other sculptures from local artists, designers and craftsmen. You can also buy nyoman nuarta book written by maestro indonesia jim supangkat. In place of this Workshop also, visitors can participate to make works of art ranging from making statues, coloring, making graphic art, batik and many others. Want to be more serious, with at least 3 participants you can take a sungkat course that will be taught by experienced nuart experts that are opened every day. If you want go to Nu Art the public transportation that can serve you is Taxi or Online Taxi. 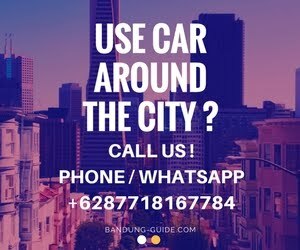 You can also go to there use private vehicle like Car or Motorcycle. If you go by Private Car and you came from Jakarta, you can exit Tol Pasteur and turn Left To Surya Sumantri Street after that Turn Left to Setra Duta Complex end you will find Nu Art on your right side. you are free of charge or admission anything, Except for those of you who want to eat at N Cafe or want to take a short course, then you must pay first yes.